ĐÀ NẴNG — More than 180 foreign tourists on a direct flight from Incheon to Đà Nẵng were the first visitors to the central city on the first day of the Lunar New Year on February 5, promoting a promising year of tourism in coastal Đà Nẵng and central Việt Nam. 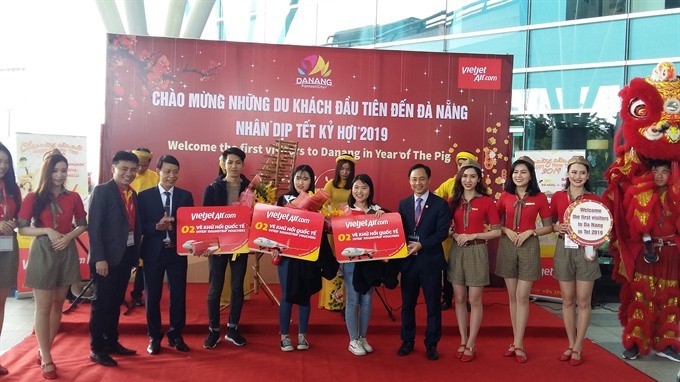 The first visitors received lucky money and gifts from the city’s tourism department and representatives of VietJetAir during a warm welcome ceremony at Đà Nẵng International Airport. Korean tourists were the second largest foreign visitors to Đà Nẵng last year, with more than 1.4 million booking tours to the city. VietJet was also the first airline to launch a daily direct flight connecting Đà Nẵng and Incheon, Korea in 2017. Đà Nẵng has 23 international air routes, of which 15 are regular direct flights, hosting 328 flights per week and 2.3 million passengers. In 2018, Đà Nẵng received 7.6 million tourists, of which 2.87 million were foreigners. According to the city’s tourism department, more than 500,000 tourists visited the city in January – growth of 14.2 per cent in comparison with the same period last year.